Doug Pfeiffer Enterprises, 1962 Doug Pfeiffer Enterprises, 1962 97 pp with 325 B&W photo illustrations Text is clean, tight and unmarked. Dedication on title page by Pfeiffer to actor James Hickman. Black textured boards with gold-stamped title along spine are immaculate. DJ tact but has considerable edgewear and several closed tears . Now in protective mylar. Doug Pfeiffer, ski instructor, ski technician, journalist and tireless advocate for the sport is one of the legends of modern alpine skiing. Born in 1927 in Quebec City, he began his early skiing career as an instructor under the direction of other legends, first at the renowned Chalet Cochand, Quebec in 1945, moving on to John Fripp's ski school at Mont Tremblant in 1946, and moving again in 1947 to earn his coveted ski instructor certification with Real Charette at the Snow Eagles Ski School, at Grey Rocks Inn, Ste Jovite, Quebec. In 1950, he moved to the Squaw Valley, California, to apprentice with the famed French skiing innovator, Emile Allais, originator of the "pure parallel" skiing method. Thee years later he was appointed co-director of the ski school at the developing Snow Summit ski resort near Los Angeles. Always an avid student of skiing technique and an innovative stylist, his interest in Dr. Fritz Reuel's book "Possibilities in Skiing", published in 1929, contributed to his continued experimentation with technique and the emergence of certain freestyle moves still in use today. 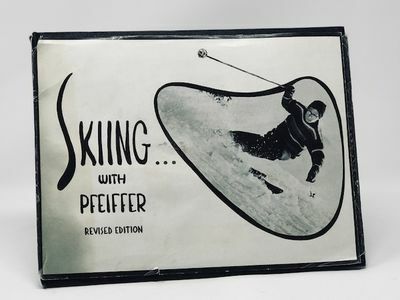 His accumulated knowledge was eventually published in 1958 as "Skiing with Pfeiffer", described as ".a ground breaking how-to-ski book." with an illustrated chapter on freestyle skiing stunts. His exploits may have overshadowed his contribution to other aspects of the sport notably, to its organization. He was a founding director of the Professional Ski Instructors of America (PSIA) in 1961, serving as a director of that influential body until 1966. Earlier, from 1952 until the formation of the PSIA, he was President of and an examiner for the Far West Ski Instructors Association for which he restructured the certification standards and contributed towards national recognition of the certification. In 1987, he was inducted into the US National Ski Hall of Fame and, in 1998, in its 50th Anniversary issue, "Skiing" magazine credited him with being one of the 25 most influential people in the sport in the previous half-century. Courtesy Canadian National Ski Hall of Fame . By Author on Title Page. Third Printing. Hardcover. Fine/Poor. 11" x 8.5" .. Signed by Author(s). Third Printing.. Hardcover. Fine/Poor. Dust jacket present.